He stood on his own next to the Dean who showed him the Polygalla Bursista in full flower. Was this the life he’d made for himself? Chatting to the college principal while she stood surrounded by a crowd in the middle of the Second Quad? The noise of their excited chatter echoed off the warm stone walls and penetrated the shadowy corners of the old building. A shaft of evening sunlight caught the bright sheen of her hair and her joyful laughter radiated happiness he longed to share. It filled him with envy and a strange, powerful impulse. The day he won a scholarship to Jesus College had seemed the highlight of his young life. His Headmaster paraded him before the school like a prince. She never showed it, but there again, she seemed too busy with her own set to bother with him. His adoration was his problem not hers. She lived in a world of admiration. Like a pretty goldfish and she swam elegantly through life with a lazy flick of her tail. There was a moment of surprise when she passed the university entrance exam, but it was not a scholarship or bursary. “Yes,” she said, and turned away as one of her girlfriends came rushing to hug her success; the two girls sharing the embrace that drove his imagination to a whirlwind of jealousy. As the term approached, he worked at a local garden centre to earn enough to buy an old car and with some difficulty managed to pass his driving test. His father teased him. “Now you’ll fetch the girls, me lad!” He smiled and made no reply. He didn’t want to ‘fetch the girls’ -he just wanted one girl to notice. Then one afternoon, she stopped and chatted to him. She was on her way to some tennis game and passed his house. She glowed with health, her tanned legs set off by her white skirt and neat trainers; he thought she looked wonderful and she knew it. “Going up in your new car?” She said. He noticed how she had learnt the lingo already. He nodded mute with shyness. She pushed a strand of dark hair out of her eyes and gazed directly at him. His heart jumped and he wanted to say he would do anything she wanted, but all he could manage was “Ok.” She grinned and waved. He wanted to say something, but she ran on and the moment was gone. “Will you keep your promise?” her head tilted back and her lips parted slightly showing the tips of her white teeth. She raised her eyebrows in mute enquiry as if she was unsure. Late that night, her father arrived and brought three suitcases and a trunk to their front door. Matthew could hardly miss the fact that the car he drove was a Volvo estate car with twice the space of his little Renault. He set the heavy cases down on the pavement. Would she call? All evening he waited, but nothing came. Next morning among his farewells, he watched for her and met Sally her best friend at the street door. That first term was a confusion of new experiences. Sharing rooms with some public schoolboy; finding out the geography of this strange academic world; struggling with concepts and social behaviour; but she was never out of his mind. He saw her at a distance in the High street; she waved across the road but didn’t stop. He tried to catch up with her but she turned into a college doorway before he could reach her. He fancied he could still sense the hint of a fragrance she used as he stopped at the big wooden door. Another time he waited outside the gate of St Hilda’s to catch her as she went out. He stood there for more than half an hour in the drizzle waiting for her,with a little speech to appear cool and confident but she never appeared. As he walked back to his lecture, he passed a coffee shop and she was perched on a stool inside laughing with some toffee nosed undergraduate who smiled and teased her. She saw him and waved for him to come in. His damp tweed jacket clung to his body, and its woody wet smell steamed in the warmth of the café. The other young man examined him as he stood, bedraggled in front of her. Matthew shook his head, he tried to think of something to say but words never came. “Ok, have started research on Plant Genetics.” As soon as the words left his mouth he knew they were the stupidest thing he had ever said. She pretended to pay attention but he knew her too well; her blue eyes soon flicked away from his and looked past him into the view beyond his head. He hated the stupid word. Why not say vacation? or holidays? “Yes, maybe sooner!” He gritted his teeth. At last he had found a spark of determination. Tomorrow, in the second Quad, while the summer party was in full swing, he’d leave the stuffy old Dean to his shrubs and tell her how he felt, whatever the consequences. Who said there were no more heroes? ''I bought this book of short stories wondering if it would fit in with my commute! Yes, it does exactly that, with a wide choice of short stories. They are very varied and I especially enjoy the crime ones which remind me a little of Elmore Leonard. Five stars. "I found Paul Purnell's short stories a gripping read! Full of intrigue and tension, I found it difficult to put the book down and felt compelled to read story after story , through to the end. A great read, with intriguing twists. 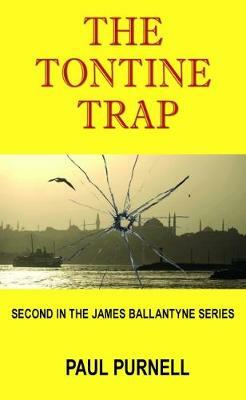 Highly entertaining"
Escape from Kazakhstan lands James Ballantyne in a Russian prison. What seems to be an easy way out turns into a dead end. Only the charm of Ocksana Petrova, his girlfriend, gets him away from a penal colony and back to London. But he has to pay the price by agreeing to infiltrate an international conspiracy known as `The Tontine.' His boss at the Foreign Office details him to identify the leading members and steal the Matrix which is the secret weapon they mean to use to disrupt Oil Supplies to Europe.